Pre-1927 Routes - Not a depiction of an actual route marker. Where the route has a common, continuous history with a newer route this symbol will appear with that listing. 1927 Designation: May have still been NM-76, though early1930s maps do not show a NM-76. Present-day roads along this route: No road in existence - current NM-76 runs west of this road. If this road existed as a state highway after 1927, it was for a year or two. This route is east of the current alignment of NM-76. Because of the apparent lack in continuity, this is shown as different from the subsequent NM-76, even though the roads are in the same general area. Taken May 2005 at east end of route at Peñasco. History: Current version of this road established 1940s. Route essentially unchanged from that time. Comments: Appears to follow the routing of pre-1927 Rt. 77, not 76. This road is west of and more direct than Rt. 76. This designation probably derives from historic Rt. 76, though. History: Original route, established mid-1930s, is the current extent of the route. It was extended east through Mogollon to U.S. 60, though there are inconsistencies in my maps that make the extent of the route's extensions and the exact dates uncertain. It was definitely extended to U.S. 60 by the late 1940s and was marked until 1988. This segment was broken up that year: NM-159 extends to east of Mogollon; it is NFS road past Elk Mountain; NM-163 past Railroad Canyon; and NM-52 relocated from its pre-1988 northern end. Improvements: Current section paved two lane. History: Established late 1940s. This road was brought into the state highway system about 1940 as an extension of NM-81 from its end near Antelope Wells to the west and north along what later became NM-180 and later NM-338. Any connection to the Mexican border was made part of NM-81 when the south end of that road was realigned around 1960. Removed from state highway system c. 1980. Comments: This road has apparently been taken over by a private landowner. It shows on USGS topo maps of the area but is marked "Private Road." See comments for photo discussion. Probably not established pre-1927. First use of the number was U.S. 80. History: This route was originally U.S. 80, the segment that turned south from the main direction of westward travel toward Douglas, Arizona. It was redesignated around 1990 when U.S. 80 was decommissioned west of Dallas. The entire loop was renumbered as SR-80 in both New Mexico and Arizona. Comments: Photo at left is taken at the junction of U.S. 70 and BL I-10 in Lordsburg, a point not now, nor ever on NM-80. See my photos page (scroll to bottom) for a picture of the entire sign assembly and a discussion of why this route is erroneously marked there. 1927 Designation: May have still been NM-81 for a year or two until NM-11 was realigned. History: Established between U.S. 80 and Hachita in the mid-1930s. The 1940 official New Mexico map shows it extended south to near Antelope Wells, then west across San Luis Pass and then back north to Animas. (The map is ambiguous enough about its markings that it could have extended north to Lordsburg - I won't assume this though.) This east-west portion became NM-79 some time in the late 1940s, and the north-south part became the extension of NM-180 from Lordsburg. The south end of NM-81 was realigned to go directly to Antelope Wells around 1960. The segment north of Hachita was renumbered NM-146 in 1988. Improvements: Now paved in its entirety. Comments: This looks like a very lonely road, especially since Antelope Wells is not a major port of entry. History: Established c. 1930. Renumbered NM-92 in 1970 to avoid duplication with U.S. 82. History: Established c. 1928 from Alamogordo to Maljamar over early NM-33, by 1930 reached Texas border E of Hobbs. By about 1944, U.S. 180 was routed over NM-16, and NM-83 was rerouted over former NM-34 to the Texas border. The connection to Texas was severed in 1988 when NM-132 took over the segment of NM-83 to Texas. Comments: (*) The west end of this route originally went through La Luz, north of its later alignment (after the 1940s). This road is still here and the piece between U.S. 54 and La Luz was later designated NM-545 (now removed from highway system). Present-day roads along this route: Harding County Road C south of Gallegos; NM-102 near Bueyeros; Gap and Bluefront Roads through Miera; part of NM-562 near Thomas. The south end of this route, where it crossed the Canadian River north of Tucumcari, no longer appears to exist, at least as a public road. Also, the route south of Bueyeros appears to run west of present-day NM-102. It also does not appear there was a NM-84 in 1927, even though the number would not have conflicted with a U.S. route number at that time. This road was redesignated in 1927 to prevent duplication with newly established U.S. 85. Of course, the number chosen would require redesignation a few years later when U.S. 87 was brought into the state. 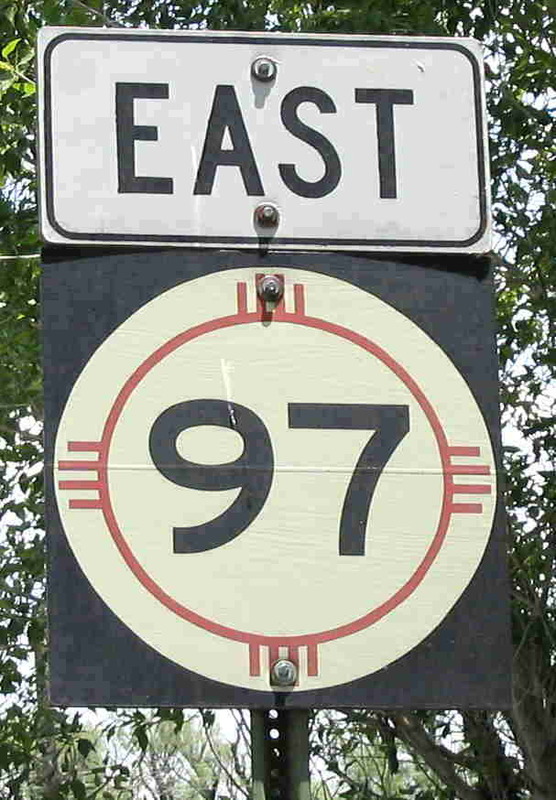 The portion of this route between Ragland and Tucumcari became part of NM-18, which had previously taken a more easterly route; NM-87 was then routed onto this former piece of Rt. 18. History: Established mid-1930s. The southern portion of the route south of House was eliminated from the state highway system in 1988, and the northern portion was incorporated into NM-252. Comments: This is the first of a cluster of sequential routes generally located in the Llano Estacado area of eastern New Mexico. This series ran from 86 to 93 (except 90 --- but I have not found a NM-90 in this area since that number was first used in the 1960s). Present-day roads along this route: Possibly part of NM-105 south from Gascon, but most of the route is nonexistent. History: Established mid-1930s, but renumbered as an extension of NM-88 by the late 1930s to avoid conflict with U.S. 87. In 1988, this part of NM-88 was renumbered NM-278. History: Originally part of Rt. 88 , established north of U.S. 60. Extended south to Portales in the early 1930s, then east from Portales in the 1940s, eventually to the Texas border. The portion west and north of Portales became NM-267 (to U.S. 60-84) and NM-268 in 1988. History: Route established mid-1930s east of NM-88 (currently 268). Extended west to NM-86 (now 252) in the mid-1950s. Portion east of Weber City renumbered NM-288 in 1988. Comments: Another case where the original segment of a highway is the one that was renumbered in the 1988 renumbering. Present-day roads along this route: County roads N of Lumberton; U.S. 64 Lumberton to Monero; no present-day road from Monero south. The northern part of this route from Lumberton to the state line was part of the state highway system in the 1930s. These routes disappeared after U.S. 84 was extended into Colorado. History: Part of the original U.S. 180 (I), it was renumbered NM-180 around 1934 when that U.S. route was eliminated. It carried that designation until about 1961, when U.S. 180 was extended west from El Paso into New Mexico (forming that route's western leg in NM) and replaced U.S. 260 to Arizona. It was then renumbered NM-90. The eastern part of this route was renumbered NM-152 in 1988. Improvements: Two lane paved road the entire length. This road likely stayed a state route for at least a couple of years, but I have found no evidence for a state highway on this route from the 1930s to the 1950s, at which time the route was returned to the state highway system. History: Runs on part of pre-1927 Rt. 91, but there may have been a period when there was no state highway along this road. Current version of this route appears to have been established in the 1950s as a route from Santa Rosa to Puerto de Luna. It was extended north to Santa Rosa Lake State Park in or after 1988 but appears to have been truncated at its original terminus. Comments: Because this runs on the same basic alignment as the pre-1927 route, they are shown together in this description even though there appears to have been a period when the state relinquished the road. A state highway has existed along this general alignment since the early 1920s, and the only reason for the route number changes was to match the adjoining route number in Texas. History: Part of original Rt. 92, kept this original designation for many years and then renumbered NM-116 about 1960 to match the new designation for the connecting Texas route. Comments: This route has since been renumbered again as NM-114, again at the behest of Texas which renumbered its highway when it created a continuous route all the way to Dallas. History: Established c. 1930 as NM-82, was renumbered 92 around 1970 to eliminate route number duplication with U.S. 82. The route number was changed in 1927 when this route was consolidated with Rt. 65 east of Mosquero. No connection with post-1927 NM-93. History: Established mid-1930s. The main change in the route alignment is that the original portion from Broadview to Bellview was made part of NM-241 in 1988. It's not clear whether the truncation at the county line occurred in 1988 or some time later. Improvements: Gravel most its length. This route has been a consistent part of the state highway system, though to this day it is unpaved and does not serve major population centers. No connection with post-1927 NM-94. History: Established mid-1950s along its current route. Comments: Forms an alternate route, running west of NM-518 (old 3) through or connecting to some of the little villages along the east slope of the Santa Fe Mountains. It's about the same length as the corresponding segment of NM-518. By 1927, it appears this road was extended from its north terminus to Mora. It isn't clear why the route number would have changed, from 95 to 94, since this was not combined with an existing route, nor was there a numbering duplication with another route. No connection with post-1927 NM-95. History: Established mid-1930s. Extended north to U.S. 84 in the 1940s, unchanged until 1988 when the southern (original part) was in part removed from the state highway system and the remainder renumbered NM-595. Comments: Another case where the historic original route is the part that got the new number in 1988. History: Part of original Rt. 96 . Possibly terminated at NM-74 (became U.S. 285) for the first few years, but extended east to U.S. 64 by mid-1930s. Extended west to NM-44 in the mid-1930s (present-day extent of route). In 1988, only the western portion retained NM-96 designation. Renumbered NM-554 (west of U.S. 285) and NM-567 and NM-570. Comments: U.S. 84 temporarily occupied this route for the first few years of its existence in the mid-1930s. 1927 Designation: Probably none. It appears what is present-day NM-53, which was then numbered NM-35 near Zuni, had been constructed north of this road. No connection with post-1927 NM-97. History: Established 1970s or 80s. Originally connected to NM-104, but this part of road removed from state highway system probably in 1988. Comments: Actually marked from I-25 from both NM-161 exits, but ends near the more northerly exit (exit 366). This ran east of the Rio Grande from where Rt. 9 veered northeast from Rt. 1. My analysis of this road's history differs from the description in Historic Highways in the NMDOT System, in that their analysis put this road west of the river. History: Existed only in the early 1930s as a short road connecting NM-55 and the historic Largo Canyon route of NM-44. Gone as a separate route by the mid-1930s. History: Created around 1960 in suburban Albuquerque, ran mostly up Edith Blvd. It began at Broadway (then numbered NM-361 and ran north on Edith to Osuna Road, where it jogged west to 2nd St. This route probably disappeared around 1988 or may have hung on a bit later, made unnecessary as the state developed more significant arterial routes on the north side of Albuquerque. Present-day roads along this route: West of Oscura there are roads on the White Sands Missile Range (closed to the public) that correspond, but the route from Engel to Mockingbird Gap where it crossed the San Andres mountains does not appear to exist. No connection with post-1927 NM-99. An access road from Central Avenue (U.S. 66) in Albuquerque into the University of New Mexico. History: Date of establishment and removal from the state highway system unknown. According to Rick Ballentine, it was shown on an old street map of Albuquerque. Comments: Rick reports that this was the driveway to the Johnson Gym. It was never marked, as far as I know. I never saw a marked route into UNM in the 1970s. Its existence is somewhat speculative. No connection with post-1927 NM-100. History: Established 1940s. Removed from state highway system probably in 1988. Comments: Now county and NFS road. I drove around this area in the mid-1970s, and I believe this is the road that I saw an old-style route marker on.